PawCasso is a dog-friendly, unique and exciting live art auction event benefiting Homeward Trails Animal Rescue. Held at the scenic Washington Reagan National Airport’s Historical Terminal A, this elegant event will feature the original artwork from a variety of well known local artists from around the D.C. area in a live auction. In addition to the live art auction, there will also be a wine pull of over 50 wines and an upscale silent auction featuring more than 100 donations including massage certificates, vacation packages, restaurant certificates, yoga classes, travel and much more. The evening will host approximately 250 animal and art lovers and their favorite four legged friends, enjoying food, drinks and live music as well. Yes, dogs are welcome at PawCasso! Visit the Pawcasso website for more details and to purchase a ticket today! 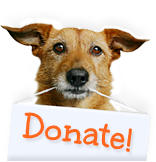 < Get Ready to Do More for Animals May 17-18 – Donations Needed!